Academically and professionally qualified son (teetotaller /​non-smoker) from a respectable family is sought by a respectable Sinhala family (Bodu/​Govi) for their younger daughter,​born in January 1989,​5’5”,​pretty,​slim and fair,​brought up with Sinhala Buddhist values,​holding BBA and MBA degrees. Reply with family details,​horoscope and contact information. (w​m​a​l​i​t​h​@​g​m​a​i​l​.​c​o​m​). A respectable Buddhist family B/​G from Panadura seeks a compatible life partner well mannered,​caring son with sober habits for their only daughter born in November,​1991. She is pretty,​kind-hearted,​5’4’’ height,​medium complexion,​brought up with Buddhist values. She studied at a leading school in Colombo,​graduated from University of Colombo and employed in a reputed firm. She wears a hearing aid to overcome mild audio defect. Please email family details,​horoscope and contact number to p​r​o​1​9​9​1​@​y​a​h​o​o​.​c​o​m​or Contact me 038-2238531 7.00 p.m.
BG parents looking educated and professional partner below 41 yrs. for their 37 yrs. 5’1” Doctor daughter fair slim pretty girl. p​r​o​p​o​s​a​l​s​.​b​g​1​@​g​m​a​i​l​.​c​o​m​Legally separated after a brief registration only. Buddhist Sinhala established parents living in U.S.A. seek a kind professional son for pretty fair 5’4”,​31 years Engineer daughter pursuing a Master’s Degree. She owns a home. Email to w​i​c​k​r​a​m​3​0​@​g​m​a​i​l​.​c​o​m​with details and horoscope. Differences immaterial. Christian Karawa parents close to Colombo seek an academically and professionally qualified partner with sober habits for their only child. She is 27 years and 5’1” tall,​after studying in a leading private school in Colombo,​She obtained her BA (Special) degree in Psychology and the LLB Degree. Presently studying for the Attorneys Final exam. She owns an upstair house. Please give all details in the first letter. Colombo Bodu Durawa parents seek professionally or academically qualified son for their daughter born in May 1987,​5’1” studied in leading Colombo school. Presently employed in a state affiliated bank. Reading for Management Degree and also banking exams. Non-malefic horoscope. Owns assets including a house in Colombo 06. Please reply with horoscope and family details. 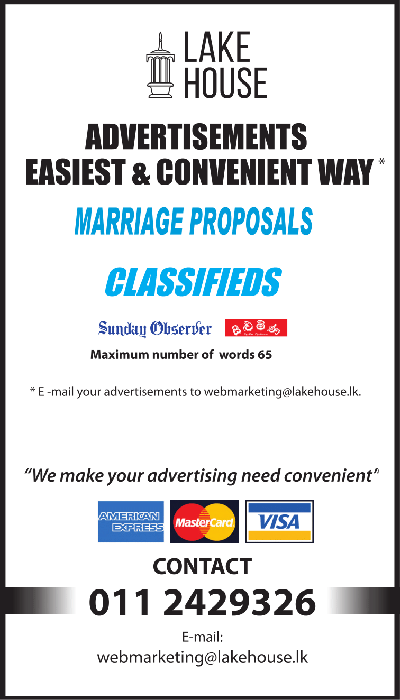 Govi Buddhist parents from Matale seek an academically and professionally qualified partner for their daughter age 33,​height 5’2’’,​studied at a leading girls’ school in Kandy. Degree holder,​working as University Executive Officer. Please reply with horoscope and contact number. Govi Catholic parent divorced mother seeks a newly passed MBBS Doctor /​Medical Student /​5th /​4th year for beautiful,​5’5” slim only daughter 1995 born 2nd year BSc Biological Science at Ruhunu University having assets PR holders in Australia too,​reply: s​e​l​e​i​.​f​e​r​n​a​n​d​o​@​g​m​a​i​l​.​c​o​m​Call after 3rd Monday 7 p.m. 0322248773. Religion immaterial. G/​B medical professional from western province seeks suitable son for only daughter,​born in,​1991,​very pretty,​very fair with substantial assets,​5’3” height. She is studying USA. She was legally separated after brief miss-match proposal marriage and plaintiff. No encumbrances. Brother medical student and USA Green Card Holder. t​n​t​p​2​0​2​0​@​g​m​a​i​l​.​c​o​m​0112412394. G/​B professional parents,​mother a physician and father a retired university professor,​well established in the US,​seek a son for their well accomplished pretty professional daughter born in July 1989,​height 5’6” of impeccable character and educated at the top Ivy league University in the US. Currently employed in a managerial position in Data Analytics at a major international pharmaceutical company in the US. Only younger brother (25 yrs.) a financial risk analyst for a reputable US Bank. We are looking for a son who is the US/​Canada or willing to migrate. Doctors /​other comparable professionals preferred She will inherit substantial assets in the US. If interested please reply with all details and the horoscope to t​r​i​a​x​o​n​e​8​7​6​@​g​m​a​i​l​.​c​o​m​. All material will be treated confientiality. Respectable G/​B retired parents in Kurunegala are looking for a well mannered caring academically and professionally qualified employed son for their 39 yrs.,​5’2’’,​well accomplished fair,​slim and pretty daughter,​holds BA (Hons) in Business Management from a prestigious UK university and MBA (UK). She is working in a private Sector company in Colombo as a Manager - Finance & Administration,​drawing a six figure salary and owns substantial assets. Please reply with family particulars and copy of horoscope to e-mail: p​r​o​3​5​6​n​e​w​@​g​m​a​i​l​.​c​o​m​Tel: 011-5883343.